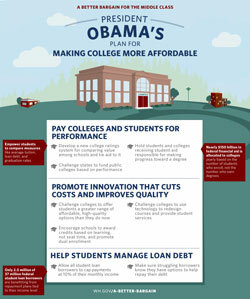 Federal Regulation to increase higher education tuition costs - reality to Obama's new education plan...!!! Obama's New Education plan 2018 disastrous for top online colleges & best universities. President Obama's new education plan suggested to get implemented by 2018 triggers discomfort among the current educationalists. A lot of positives that were been portrayed by president Obama are being challenged by the educationalists as time passes by. Educationalists are of the opinion that the speech at buffalo by president Obama was merely a crowd pleasure and the plan is not that concrete as it seems - important it is - if not brilliant. Federal regulation will reduce college cost seems to be unrealistic. It is so because if in case the suggested plan gets implemented, a revolutionary change in the higher education foray is likely to erupt with increased need of more staff - more legal fees - more insurance - more trainings - more software and equipments. From where will the money to acquire all these amenities from - obviously from the Tuition fees and who pays that...of course the students. So how would the higher education grow cheaper - god knows. To sum it up it remains a fact that more regulatory expenses - higher the tuition cost. MOOCs - massive open online courses are likely to cut down on the salaries to teachers and faculties as most of them would be fired and a very few would be required as talking heads - that too online. MOOCS will also help close down campuses and save a lot of the facilities budget which also will resulting in terminating everyone starting from faculties to a groundskeeper and the security guards at the university campuses - leading to a lot of unemployment. Just think....is it viable? A lot of brain storming and disturbing discussions leading to more and more educationalists to oppose the new education plan by President Obama to be implemented in 2018 - a flop show.